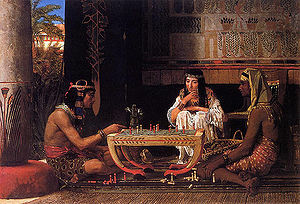 Sir Lawrence Alma Tadema, Egyptian Chess Players, 1865. Moritz Stifter, A Beauty in Historical Costume, 1889. William Blake, The Penance of Jane Shore, 1793. The Declaration of Independence by John Trumbull, 1818. Diogenes by John William Waterhouse, 1882. Tristan and Isolde with the Potion by John William Waterhouse, 1916. Palamedes before Agamemnon by Rembrandt, 1626. Creation of Adam by Michelangelo, 1512. Los desposorios de José y Asenet by Cristóbal de Villalpando. Jacques-Louis David, The Death of Seneca, 1773. Jacques-Louis David, The Death of Socrates, 1787. La liberte guidant le peuple by Eugene Delacroix, 1830. Dido building Carthage by William Turner, 1815. Benjamin West, Death of General Wolfe, 1770. Death of Montgomery by John Trumbull, 1786. The Death of General Warren at the Battle of Bunker Hill by John Trumbull, 1786. Fedor Zubov, Tsars Mikhail Fedorovich and Aleksei Mikhailovich with image of the Saviour Not Made by Hands, 1678, Russia. The Death of History Painting in Nineteenth-Century Art? Yermak's Conquest of Siberia, a painting by Vasily Surikov, 1895. This page was last modified on 29 May 2015, at 19:06.